Don't you wish that getting rid of a pot belly was as easy as breathing? It is now; because with the right ab workout effectively targeting the areas that need it most you too can have a flat tummy. When you're putting on fat, not to mention your pot belly, the room you have to breathe while trying on a pair of jeans or a t-shirt grows slim making you wish you had a flat tummy again. Paying attention to this sort of development, poundage, gives leads on what you should be doing next, tightening your stomach not getting a pooch belly. Start doing something about it before it's too late, or find yourself having to buy more new clothes…. At this point you might say that this calls for you to start doing more ab workouts, such as sit-ups, leg lifts, or bicycles in your daily routine. Well, that's a place to start when trying to get a six-pack; however what you really need to focus on are the muscles holding your tummy in place, your transversus abdominis (TVA) or simply put your “core”. If you think that doing a little sit-ups is going to matter when it comes to your pot belly, you will try and fail. In this column we are going to attack the problem at the core introducing 1-simple-exercise that will help you suppress your bulging stomach without a corset that we are going to call draw-ins. When you are busy and can't make it to the gym, but still want to do you daily abs draw-ins are for you. Not only do draw-ins help you get the slimmer waste that other exercises can't; you can do them anywhere without the need for special equipment. This makes them perfect while on the job or waiting in line at the grocery store, freedom to choose and worry no more. “How does it work?” you may be asking. Although to be successful in diet and exercise one must have faith, like one has for the mans work; for those of us with an undying urge to tinker, I'll break it down so that you can put it back together again later. Your abdomen consists of layered muscles functioning to both stabilize your core and provide means of locomotion. Draw-ins target the muscular lay furthest bellow the surface responsible for core stabilization, i.e. keeps your tummy in check. Don't expect miracles to happen overnight. Be diligent and give the work you put in time to pay off. As much as you would like to believe, there is no such thing as “fast results.” However, if continued (draw-ins that is) over time, you would be surprised how effective and ingenious this exercise can be. Continue reading to see how you can get things started. Getting started with stomach draw-ins! The feeling you get while in a relationship with an unyielding diet and exercise program is the same feeling you get being thrown into a dungeon with no control. Not many (including myself) can attest that they share this experience, but you've probably seen it on TV, HBO. At times like this not only are you ill motivated, the chances that you don't follow through is slim to none. Its time to start to get out more and see what light other methods have to offer. I don't mean going to heaven. I just mean that it would be nice to not feel like you are pushing a galleon and relax for a change. Doing draw-ins is as easy as breathing! Start out from a standing position with your arms at your side. Take a few breaths making sure you get enough air because you're going to need it. The next step requires focus, doing three things at the same time. Exhale while bringing in your stomach in. If you start to feel a burning sensation around your hip, this is what you want, your hips on fire. Hold for 15 to 30 seconds per set, doing as much as 10 sets. You may have noticed that this exercise is quite similar to what you normally do to hide your tummy. No one found out before, who says they're going to find out now. Doing draw-ins is a slick way to thin down your waist. The beach is back my friend. So say goodbye pot belly and start saying hello to washboard abs and a sexier swimsuit. Before that happens take the time to actually do the work and see that you are doing it right. One common mistake is to stop breathing (run out of air) during mid-exercise. This may differ from other exercises that are said to help you strength you TVA or vacuum your stomach that prescribe removing air from your lungs before hand. Draw-ins along with “ki” boosting techniques use in the martial arts requires practitioners to focus on breathing to avoid disrupting body movements. Focus. Put energy into the areas around you stomach and buttocks. Once you've got it the routine down, starting to see and feel results, it may be time to take it the next level. This may mean doing it during rudimentary activities such as taking a shower or watching TV. On the other hand it is said to work well when combined with stretching and interval training. After getting the results you wanted, don't stop just there. Continue doing draw-ins in combination with the next exercises you are going to conquer. Imaging what you waist size would be if you could keep this up for years. Selling yourself short, stopping after seeing results, not only wastes you time, but doesn't keep your tummy from coming out again. What causes you to get pot belly? Fact, you don't use the muscles in your abdomen as much as you would like to think. Sitting in a why that helps you relax (slouching) combined with aging cooks up a recipe for a really nice pot belly. This is thought to be caused by deformity in your pelvic region that used to hold your internal organs in their rightful place. Having your muscular strength decrease as you age is only natural. That is why as the muscles around your abdomen that use to hold you organs in place weaken, developing a bulgy stomach is not unheard of, nature taking its course. However, in the case of younger people, developing a pudgy belly is thought to be greatly affected by pelvic deformity. This happens as the muscles around your pelvic region, especially your abdomen, gradually opening up your pelvis, causing you internal organs to begin to sag into what appears to be a pot belly. That is why strengthening these muscles before it is too late with draw-ins is the best defense. Aim for greatness, a slimmer more attractive belly and you will not have to hide behind the curtains when the stage is set. Find out how! What you get out of sucking in your belly when passing through crowds of people is more than you think. You can do it! 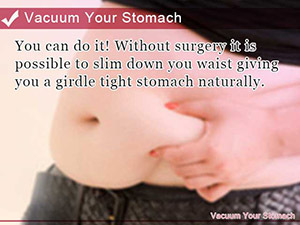 Without surgery it is possible to slim down you waist giving you a girdle tight stomach naturally. Break the habit! 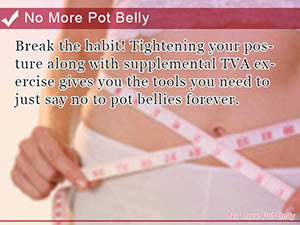 Tightening your posture along with supplemental TVA exercise gives you the tools you need to just say no to pot bellies forever.